Price is 37% below the initial Playmobil retail price, a € 17.11 discount! The Porsche 911 Targa 4S (5991) Playmobil set is available from the sites below. However, they do not offer delivery to your selected region. 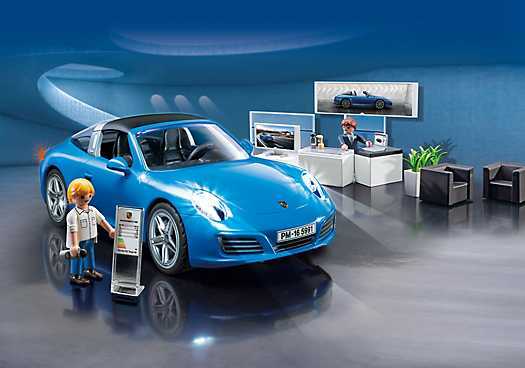 The Porsche 911 Targa 4S (5991) Playmobil set is no longer directly available from the sites below. However, 3rd party partners of these sites might still have the set available. The targa roof can be taken out and stowed away. In the front is space for 2 figures, and the rear bench seat can sit up to 2 child figures. The headlights, rear lights and dashboard light up (batteries not included) and have an auto-power-off function. The showroom comes with furniture, TV and accessories. The sales data sheet has technical information about the vehicle. Three different Porsche magazines are included in miniature.